I’ll have to re-read it a couple of times to understand the details: it’s really an awesome work (you had to spend quite some time to put the pieces together, do researches, debug windows imports loading, write and debug Cerbero scripts, ecc.). And, of course, welcome back ! You rock! this gives me some hope to be able to lift my XP Gateway to 3.7 …. Congratulations for this article! I still feel a bit dizzy after reading it! This is why I was looking for a solution to run Python on XP. It seems too much pain in the basement now; but if you find a solution to extend this tool with something-XP-ish, I’d be glad to add it as a new engine. Aaand, let me know what you think about it anyway! Not a coder and only understood about a third of it (wandered in looking for a way to run Vista/Win7 apps on XP, or at least XP64), but I’m quite impressed by your detective skills. Bravo! This article is really a pleasure to read, got some questions though, I see you use CFF explorer for many of the shots, which software is used to create this [one](https://ntcore.com/wp-content/uploads/2018/xptm/forwarders.png)? Also, you say ‘we’ll find a directory both in System32 and SysWOW64 called “downlevel”, which contains a huge list of these DLLs.’. I’ve installed a fresh windows xp as a virtual-machine, installed vcredist_x86.exe from VisualStudio2015 and I still don’t see neither that downlevel directory nor apisetschema.dll, could you clarify here? 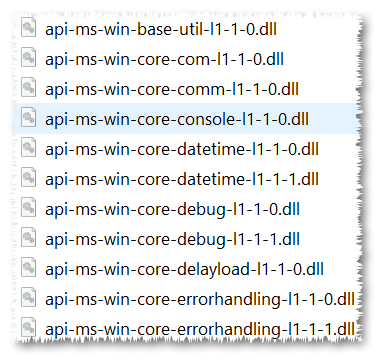 I see apisetschema.dll is living on my devbox (windows7) though… i assume this is not coming from any visual studio redistributable package? It’s a commercial application I wrote, but it has a free trial. It’s also the same application used to execute the Python code. (all those Pro headers are inside the application). 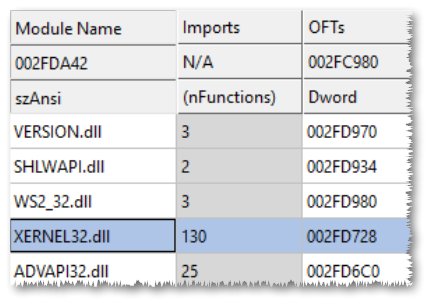 The syntax to execute the scripts is explained in the article: search for cerpro.exe -r.
The downlevel directory is present on Windows 10. I don’t know if it’s present on other versions of Windows. But those DLLs aren’t used. When you install the redist the DLLs can be found under: C:\Program Files (x86)\Windows Kits\10\Redist\ucrt\DLLs. 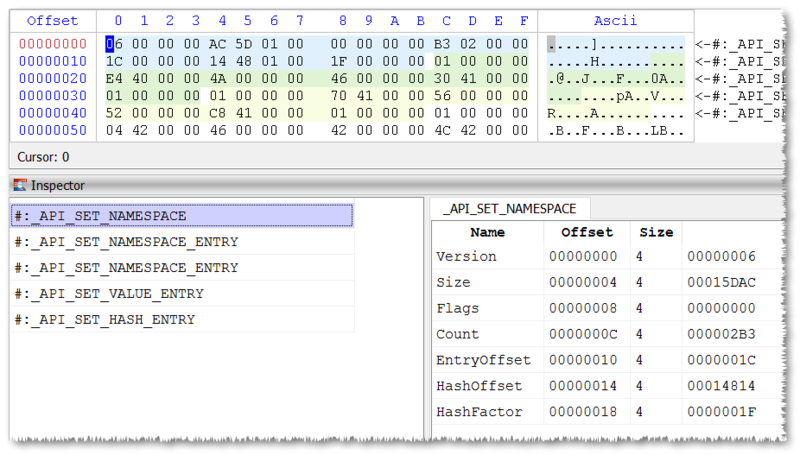 Same for apisetschema.dll. It’s a DLL in Windows 10, but it’s present also on other version of Windows (not XP). You don’t need that DLL. It just contains the mappings to establish where the APIs are actually located. first of all I want to thank you for this detailed and thorough analysis. of running an executable on XP because of a missing API. 2) do I have to create a dll (I’ll just also call it “xernel.dll”) file and just copy the content of the kernel32.cpp into it in order for it to function? Thanks in advance and I hope to hear from you soon! well the files on github have already few of the missing APIs added. So I recommend you get the files from GitHub. 1) It probably just extracts the Python files, you need to get to the point where it does it. Check perhaps with a tool like Process Monitor where it extracts the files. 2) You need to compile a xernel32 dll with the missing API, yes. No need to copy the entire kernel32, just implement the one missing API inside xernel32, the other APIs will be just forwarded.